The ware for February 2018 is an Ethernet card by Digitel, a Brazilian manufacturer, circa 1992. Brazil is an interesting market because protectionist trade measures made import electronics very expensive. The nominal theory, as it was explained to me, was to protect and encourage local industries, thus creating and maintaining high-paying local jobs. I had never seen a piece of electronics from Brazil, but indeed, many of the circuit board’s components bear company logos I had never seen before and a Brazilian country of origin. 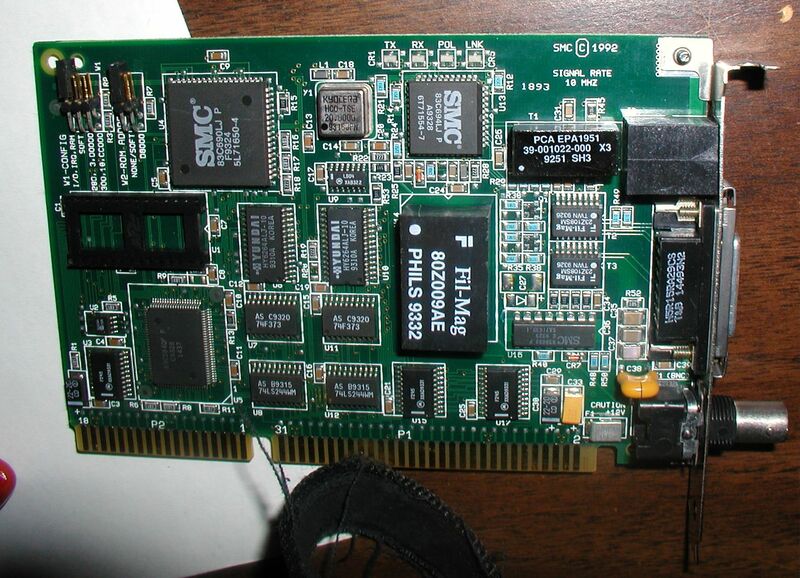 While at least facially it seems the trade policies created local jobs, a comparison of this card to its contemporaries outside Brasil — such as this 1992-vintage SMC “Elite 16” Ethernet card featured at vintagecomputer.net — gives a hint at how these policies might have also impeded the progress of technology. This entry was posted on Saturday, March 31st, 2018 at 11:15 pm and is filed under name that ware. You can follow any responses to this entry through the RSS 2.0 feed. Both comments and pings are currently closed. While your theory is interesting it should be pointed out that there is actually a chip labelled “PAL16L8” and “BRASIL” on the board, so they obviously had locally sourced PALs. bunnie, since 1992 there are no more restrictions on imports in Brazil. as a consequence, very little production in electronics, with a few lasting companies. as it turns out, the higher ups prefer to put their money in the banks and wait for the interest than to invest in their own country. the debate for whether protectionist measures are good or bad may be out of the scope here, but what I can say is that at least we had our own electronics industry back then.